Put The Plan In Writing! 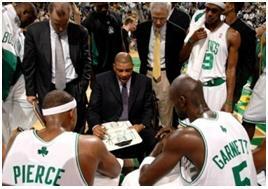 So you have determined to inspire your team to greatness, harnessing their loyalty & belief in a common cause. Fantastic! But… What exactly do you want your team to do? And… How will you make sure they are all on the same page? Answer: Do like Doc… Write it down! Practical. True. And sadly, often overlooked. Long Term Vision: where are you going over the next 5-10 yrs? This Year’s Objectives: what does success look like? This Year’s Metrics & Targets: how will we measure ourselves against our objectives? This Year’s Priorities: what are the few most important priorities/initiatives we must deliver in order to succeed? If you go much beyond this, you get extra credit… but just get this far to start! Write down the plan. Don’t worry about making it beautiful… just get the main ideas in writing, simple bullet points on a page or two should do it. Share it with your team. Get their input… do they believe with the vision? Do they agree with the objectives? Do you have the right priorities/initiatives to move the needle? For Everyone: These concepts apply in both business & in life. Have you ever thought about writing down the plan for the next 5 yrs of your life? Try it… you will be surprised at the focus it provides you in your day-to-day life choices.